However, you can also add your Checkbox admins in the Contacts area. Admins are considered contacts because they can take surveys, but you can also assign them the admin roles such as System Admin, Survey Admin, Report Admin, etc. For more info on these roles and the permissions associated with each role, please see our Admin Roles Guide. Do I have to use Contacts? What’s the benefit? The short answer is no – setting your survey respondents up as Contacts is purely optional. When you distribute your survey you can always keep it simple and copy and paste the public survey link to anyone, in which case all responses would be anonymous. You can also send Checkbox email invitations to a simple list of email addresses, in which case each response will be associated with an email address. However, if you want to save those email addresses in a list to use again, or import other information such as Name, Company, Department, etc., you will want to import your survey takers as Contacts. Contact information can then be used to personalize your surveys, can be exported with your survey responses, and can be used to filter reports or set survey logic. Adding your survey takers as Contacts gives you the added benefit of being able to view and edit personal details, as well as view a list of all their survey responses in their profile. Email or Username (one required): You must enter either an email address or username for your contact. These values must be unique for each contact. Name (optional): First Name and Last Name are optional, but recommended. Username and Password (optional): Username is only required if you don’t specify an email address. Password is optional. Adding a username and password allow you to require your respondents to manually log in to take a survey. Groups (optional): You have the option to select one or more Groups to add your Contact to, which can streamline the survey sharing and sending processes. If you don’t see any Groups available, you can add them under Contacts -> Groups. 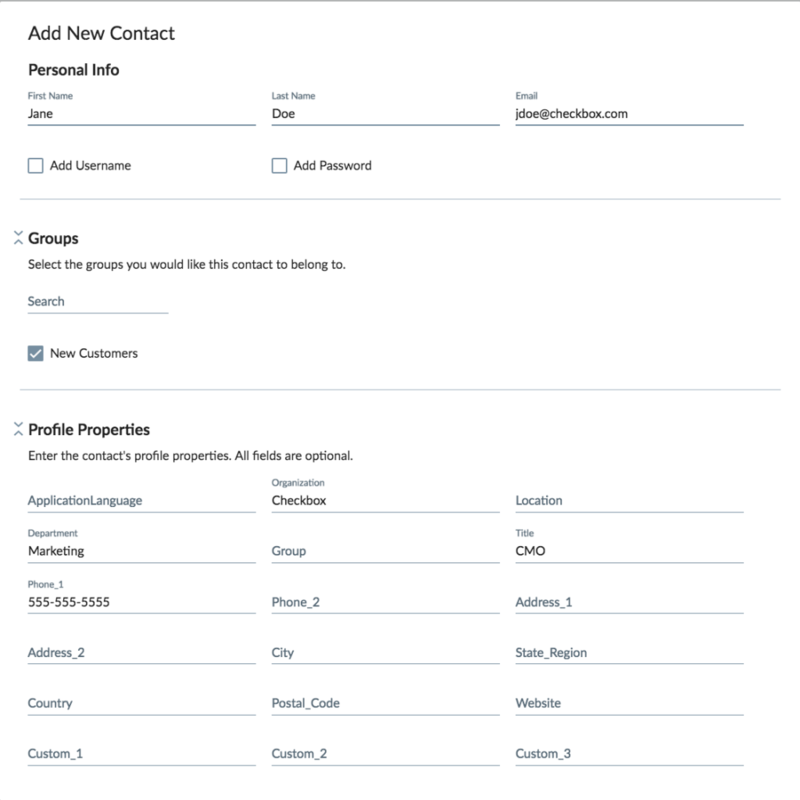 Profile Properties (optional): Profile Properties are data fields that allow you to store information about your Contacts. Checkbox comes pre-configured with the following fields: ApplicationLanguage, Organization, Location, Department, Group, Title, Phone_1, Phone_2, Address_1, Address_2, City, State_Region, Country, Postal_Code, Website, Custom_1, Custom_2, Custom_3. Contact Roles (optional): A Contact’s role determines what type of access a Contact has in Checkbox. By default, all Contacts are added with the role of Respondent, which means they can take surveys. If you’d like to give your Contacts additional access to admin roles, you can specify these in the Roles area. Please review our Roles Guide for more details on what each role has access to.